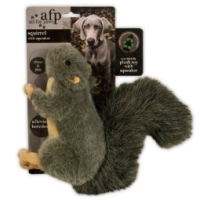 AFP Plush Squirrel Dog Toy has been developed to engage with your dog's natural hunting instincts. This premium, plush squirrel toy is guaranteed to bring out the inner canine in any dog and boasts a concealed squeaker for added intriguing and excitement. Ideal for chasing, playing and alleviating boredom in dogs; this toy is guaranteed to provide hours of fun! Polyfil, developed from recycled bottles has been used to stuff this environmentally conscious toy.